Last 13th of unlucky Friday, teachers and students went to the Art District. We met at the school at 6 PM and departed to the Art District. Our first destination was Urban Radish. Urban Radish is a grocery stores that provides good quality of local food. I ordered a veggie burger, it was fresh taste. Next, we were heading to Hauser Wirth & Schimmel, the modern art museum. However, it was closed. We were not able to visit. We left the place and walked the street. We visited a few famous stores and saw the stunning graffiti. Finally, we visited Angel City Brewery. They can produce fresh beer. People enjoyed their drinks, some groups played board games, and looked at the art gallery. It was a nice experience of American night activities. Public art is art placed in areas that are accessible to the public audience. In general, it should be free for people to enjoy public art. Other than decoration of the block, some public art also serves educational purpose as illustrating ideas or historical moments in a vivid way. 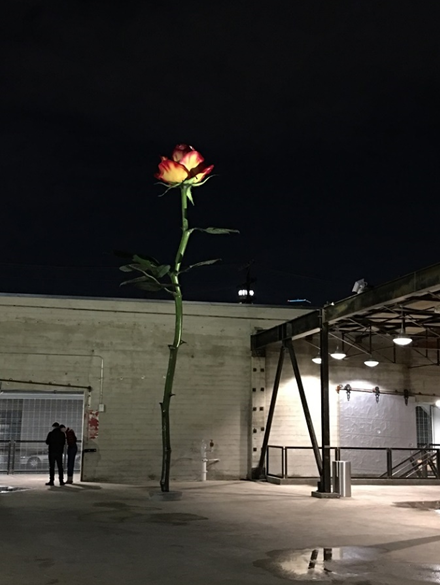 Most permanent mounted public art blends in well with surrounding buildings, structure, and environment, and becomes icon of the neighborhood. On the contrary, temporary mounted public art is always placed for special events or activities. Reason: Giant rose sprouts from hard concrete ground symbolizes vigor of life.